Welcome to another installment of "my tiny career." My quilts to share today are my own creations, mostly made from antique fabrics. If you have been following this documentation of my pre-blogger life, you'll know that most of my career was spent hand quilting antique tops or tops made from antique fabrics. Then there was that period of time when I tried selling my own little quilts at craft shows (Ugh!) or on consignment. But there's one more little piece of the story that I have mentioned before. 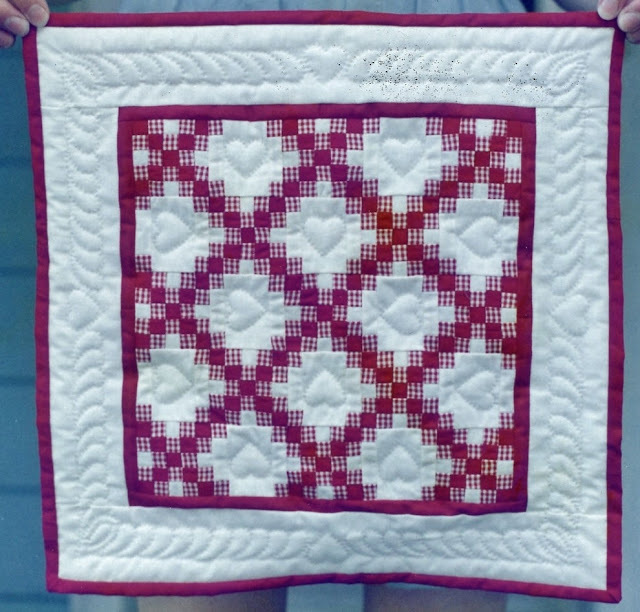 In the late 1980s I met a woman (let's call her ML--those are her initials) who had a booth with antiques and quilts/fabrics at a show at a nearby mall. After a conversation about quilting and my experience, she told me she would buy any quilts I could make for her. She also brought me a box of antique fabrics to use in some of them. 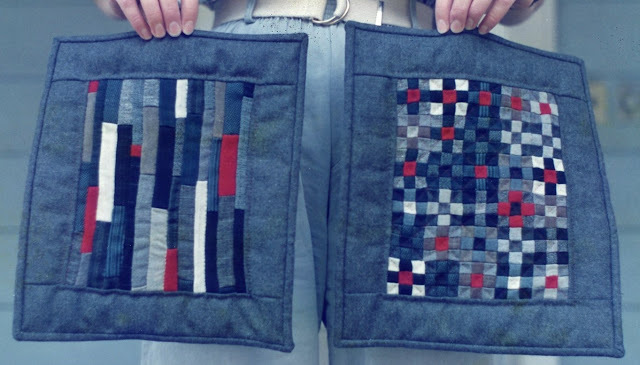 At that time, I was fascinated by the techniques I had learned from Becky Schaefer while working for her and reading her book Working In Miniature, so with my new-found confidence in my own quilt-making, I focused on tiny quilts. I pieced all of these quilts on my Singer Featherweight. The batting was likely light weight polyester from Mountain Mist. 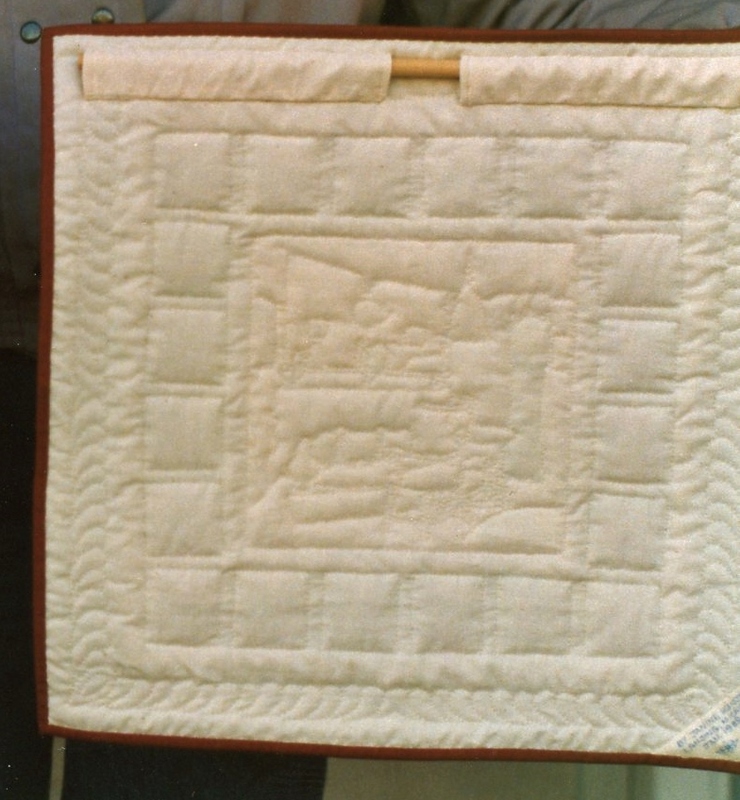 All of the quilts were hand quilted, mostly with off-white thread. The backings were off-white--possibly a good quality muslin, but I think maybe a smoother cotton. I don't recall how ML and I arrived at prices for these quilts. I did keep track of the amount of thread I used for quilting because that was the way I had always been paid before, but we probably negotiated a flat-rate price. For that reason, I won't record the thread used here as I did for previously documented quilts. 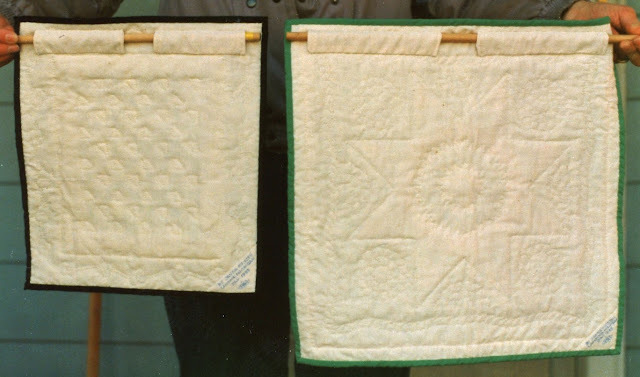 First up are two log cabin rose quilts I made in February 1988. I'm uncertain of the source of inspiration. Both quilts are 13 inches square. 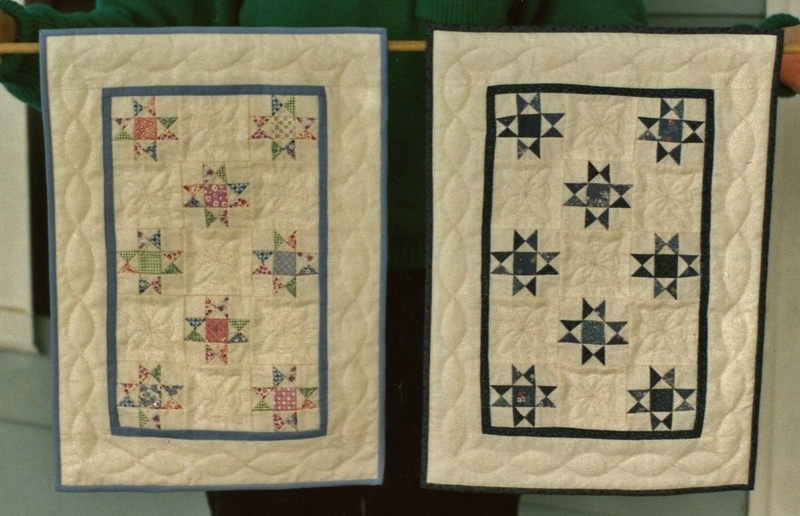 The quilt on the left is from antique fabric from the 1930s. I made the one on the right from 1980s fabric. You can see that the colors in the '30s fabric are softer and clearer. Fabrics in the '80s had a yellowish or grayish cast. Quilts are reversed in this photo of the backs. I quilted minimally in the logs, did stylized flowers in the large outer triangles, and a little vine in the borders. 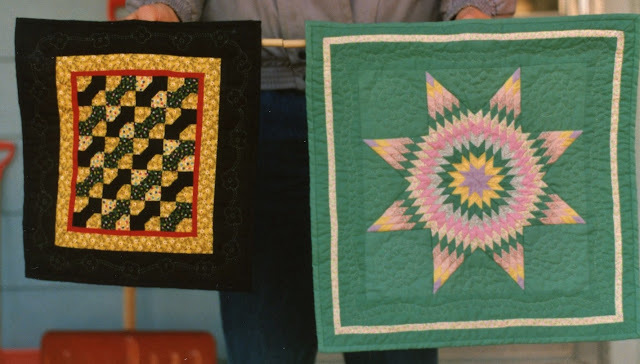 Next, two fan quilts, February 1988. These are 12 1/4 by 14 1/8 inches. Again the one on the left is from 1930s fabric and the one on the right from 1980s fabric. Quilting echoed the fans, with scallops in the borders. It was interesting to me to pick fabrics with small enough prints to be interesting but not overly large in scale. Quilts in reverse order here again. I have a little notebook with my drafts of some of these quilts. Most of the notes are indecipherable (my notes still look that way), but here is the page for these quilts. The plastic templates I made for the fan pieces are taped near the bottom. These next Ohio Star quilts are also from February 1988. (It must have been a cold winter! I got a lot of quilting done. )They are based on Becky's drafts. Again, 1930s fabric on left and 1980's on right. They are 12 1/4 by 17 inches. 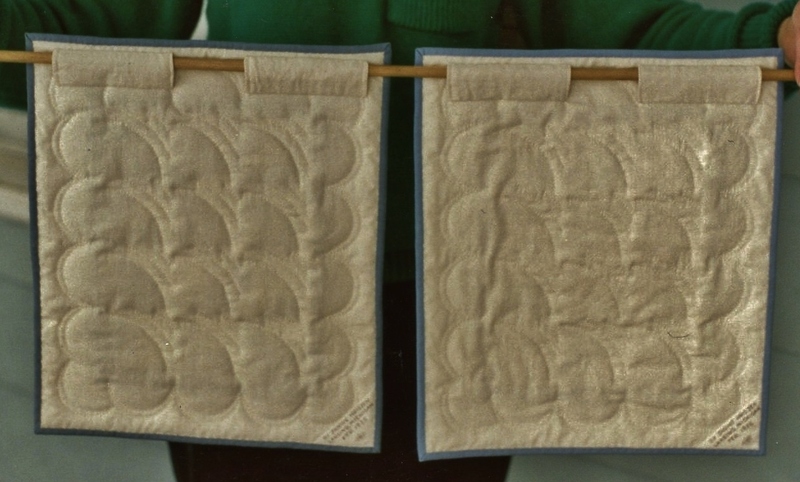 I quilted leaves with circles in the plain squares and a simple cable in the borders. Minimal quilting around the dashes, and my simple vine in the border. An old fabric panel (I don't know the vintage) was in the inspiration for the colors of the churn dash blocks and the borders in this quilt from January 1989. 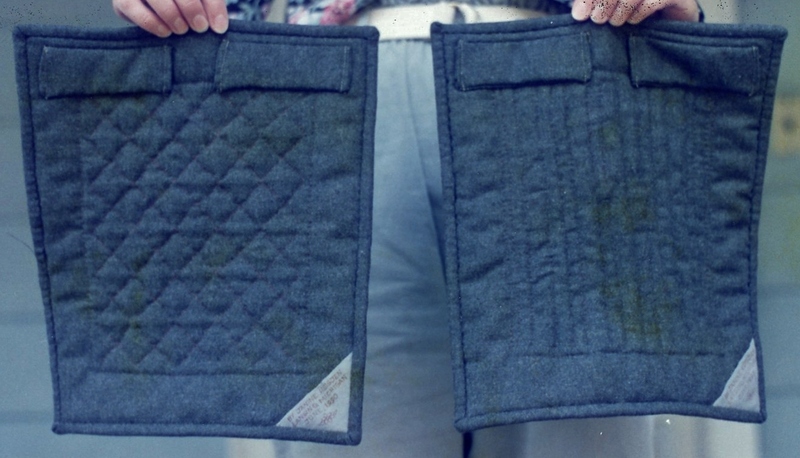 The solid fabrics were a mix of older and newer fabrics. The quilt is 16 1/2 inches square. 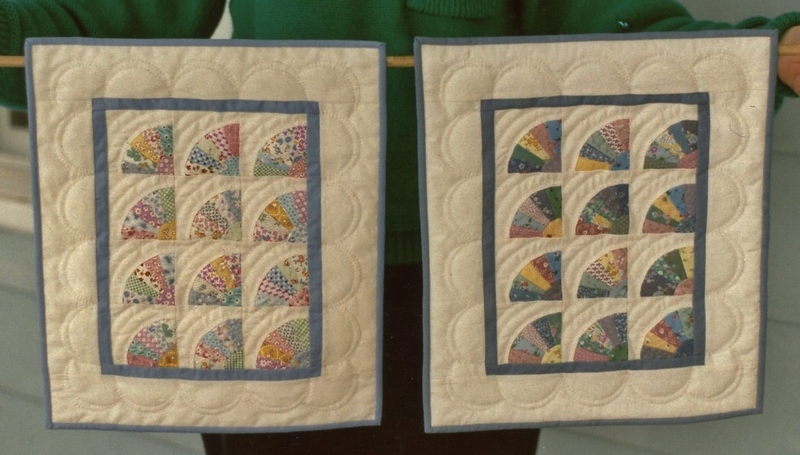 I quilted around features in the scene, outlined the dashes, and did a sort of half feather in the border. Quilting the borders were my favorite parts of these quilts. I drafted the pattern for the black and yellow Bow Ties (fabric from the 1930s-'40s. It's 13 1/2 by 12 1/4 inches. I quilted around the ties and then did trailing flowers in the border. The quilt on the right is a pastel Lone Star, made from a pattern and techniques from Becky's book. The fabrics are mostly 1930s with a few '80s thrown in. It's 15 7/8 inches square. 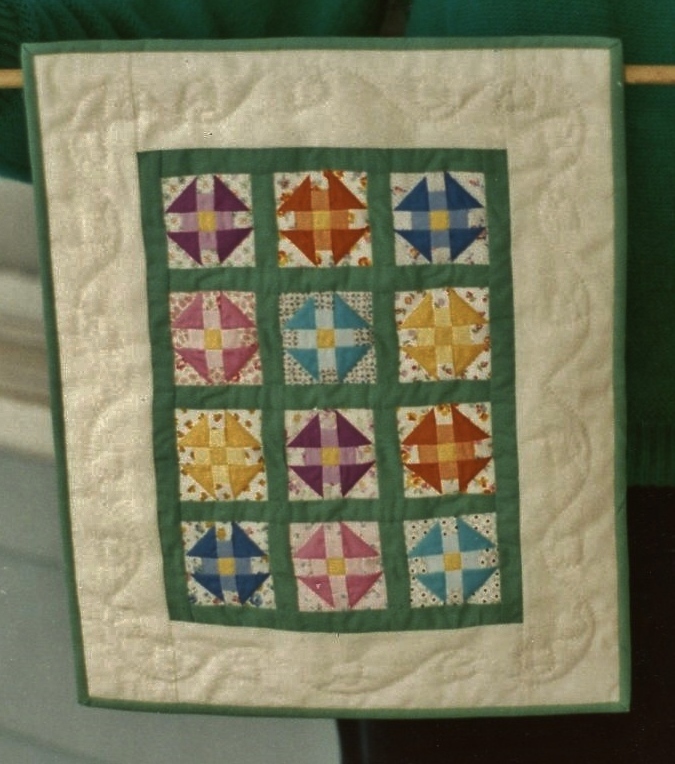 I quilted jagged circles in the center (to follow the diamond shapes), feathered circles around the star, and a rope in the border. These were both finished in January 1989. I have no notes on this next quilt. I do know it's an Irish Chain from Becky's book, and that at least the red fabrics are from ML's box of antique fabric. I'm guessing it's about 14 inches square. It's quilted with hearts and that sort of feather design. I don't have a photo of the back. That photo's not real clean, is it? Hmm. ,And these last two are an experiment in making Hired Man's Quilts from a set of suiting samples that I found in the box from ML. I'm not sure if the border fabric was also in there. Anyway, I remember these as exceedingly difficult. I probably should not have used that fabric on the back. I doubt I used any batting. They are straighter than they appear to be--just hanging funny, but you can see how thick they are. (The quilts are reversed here.) I remember that I had to use a stab stitch to quilt them because I had trouble rocking my needle through the thick seams. It was an interesting experiment, though. I don't have any notes. I'm guessing the quilts are about 10 by 13 inches. Looks like the label says they were made in June 1990. 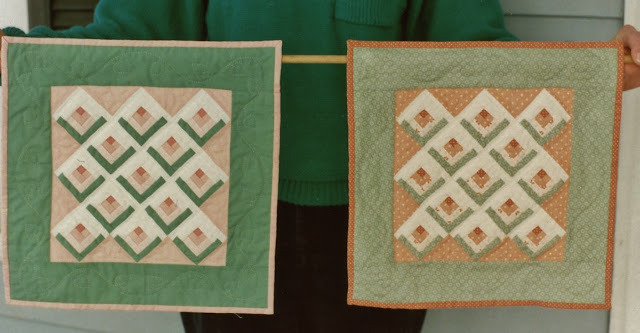 I have one more group of mini quilts I made for ML from "modern" (1980s Ha!) fabric, but I'll save it for next month. I hope you've enjoyed my minis. These were made with a lot of strip piecing and short-cut triangle piecing techniques. If I made them today, I'd probably try paper foundation piecing as much of the blocks as possible. They were a neat challenge, though, and it was fun to be able to make whatever I wanted and know I had a buyer for them. I'm linking up today with Sandra at mmm! quilts for Throwback Thursday. Make sure you check out her post. (They always contain fabulous stories!) Share some oldies from your pre-blogging days, if you have them, or just enjoy the ones other quilters have to share. I find your mini quilt career fascinating. I was rubbing my hands together when you said you had "one more little piece of the story"! 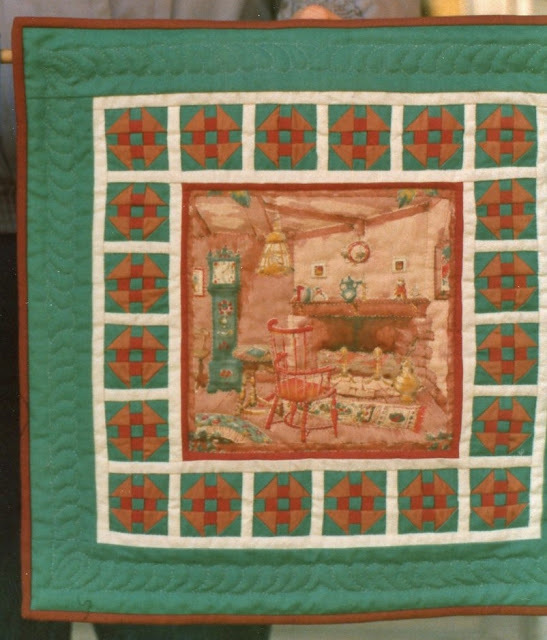 I always think about what I was doing during those years and how if I encountered one of your little quilts at that time, I would want several to hang on my walls. It's funny how I prefer the antique fabric to the "modern" fabric. I think my favorite quilt is the Ohio Star, although I love them all. And the quilting on the heart quilt is my favorite quilting. How did you "make" plastic templates? I enjoyed seeing the white pants belt in some of your photos - I had one just like it in khaki. Probably wore them with high-waisted slacks. Lol! Wow, these are so neat. Thanks so much for sharing! I was thinking about your quilts the other day - have to do a mini and then a vintage for Island Batik and was wondering about your posting. Glad to see you back. Again, Janine, I am just blown away at your precision miniature piecing skills!! That Lone Star?? Like I tried to break it into 4X4" to kind of get an idea on the size of those teensie-weensie diamonds, and are they like 1/2" if that?? And NOT paper-pieced? Incredible. 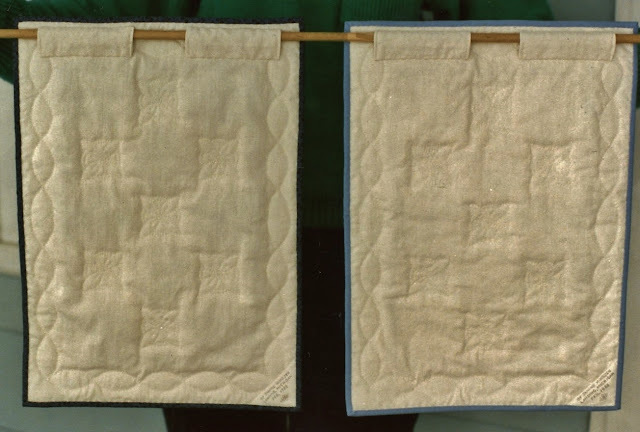 As are your hand-quilting skills, something I have never mastered due to sore fingers, mostly the bottom one, from stabbing the needle into it as I 'catch' it to rock it. 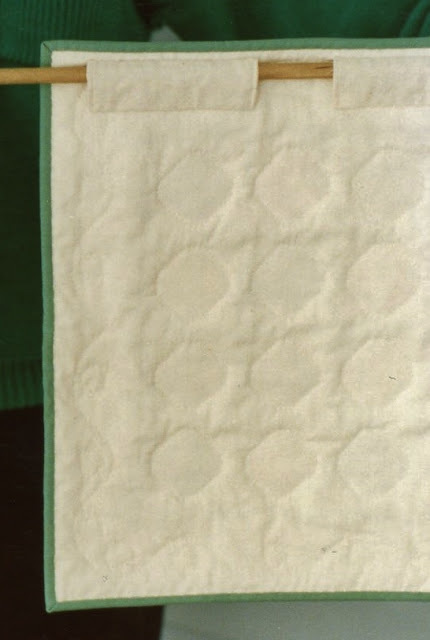 So interesting (and rather blah) the 80s yellowish-cast fabric, and how clear the 30s is. Thank you so much for linking up again, and I can't wait to see the next instalment. What beautiful projects, and such tiny pieces!! Your hand quilting is gorgeous! My grandmother made a full-sized quilt of all men's suiting fabrics - and even without batting, it weighed a ton... I'm not sure what the term "hired man's quilt" means though - is it a quilt of lesser quality, or using more durable fabrics as opposed to the traditional cottons? I have seen so many quilts from your tiny career that I am starting to think you should stop calling it 'tiny'. Another beautiful collection - I was really interested in the difference between the vintage fabrics and those from the 80s. As always I marvel at your quilting skills. I started quilting in 1979 when my sister-in-law introduced me to patchwork and started me on a subscription to Quilters Newsletter Magazine. For years I kept track of my projects through photos, but I've never been good at recording the specifics about what I've made. I started this blog mainly for myself to boost my efforts at documentation.